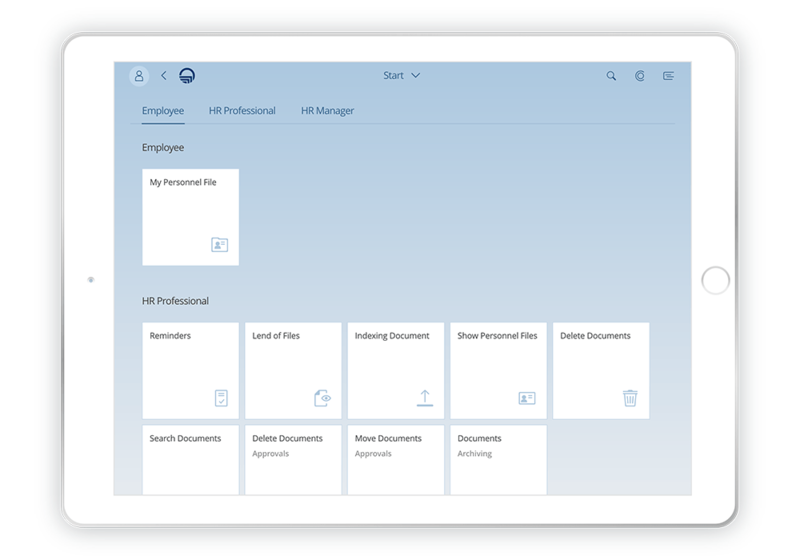 Work contracts, letters of reference, personnel master data – the SAP®-based EASY digital personnel file provides information on every employee. It bundles all relevant data and documents and dovetails closely with SAP® Human Capital Management® (HCM) and SuccessFactors®. A sophisticated security concept based on the SAP® authorization management ensures that sensitive personnel data don’t wind up in the wrong hands. Processes and approval procedures can be started directly from the file – even via smartphone, tablet, or other mobile device, if necessary. 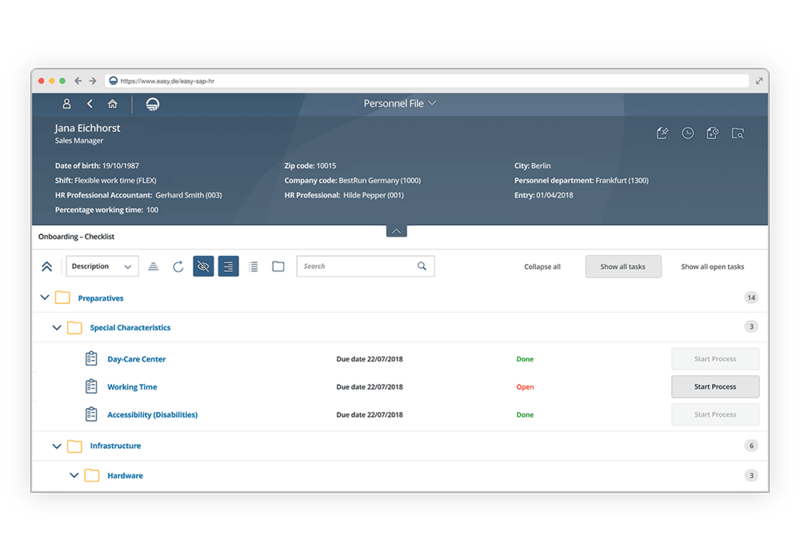 The digital personnel file from EASY saves time and money, and bundles resources – and is also the right choice where data protection is concerned. 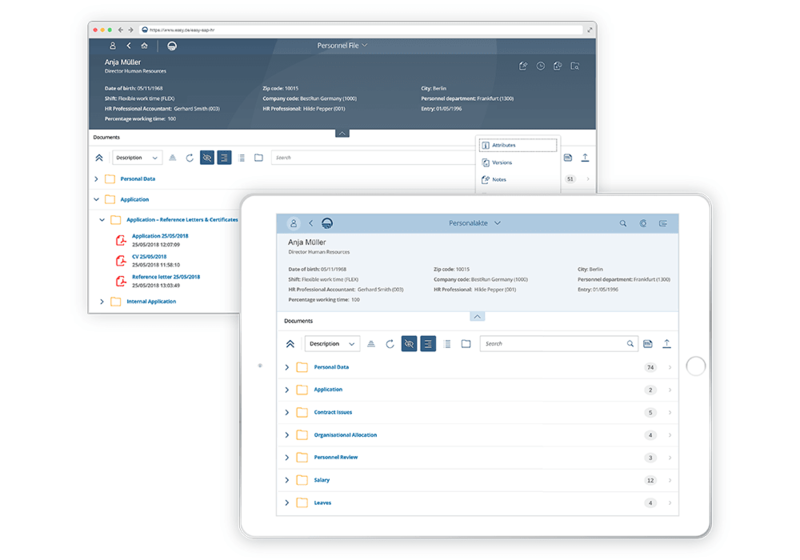 Without additional effort, it can be linked to file view or file check-out with ESS/MSS scenarios and really shines thanks to the new interface designs, such as the integration in the HR Renewal portal and SAP® Fiori® or HTML5. Location-independent access is possible via SAP® GUI, SAP® Webportal, SAP® Fiori®/HTML5, or the employee portal. The electronic personnel file also supports mobile devices such as smartphones and tablets. 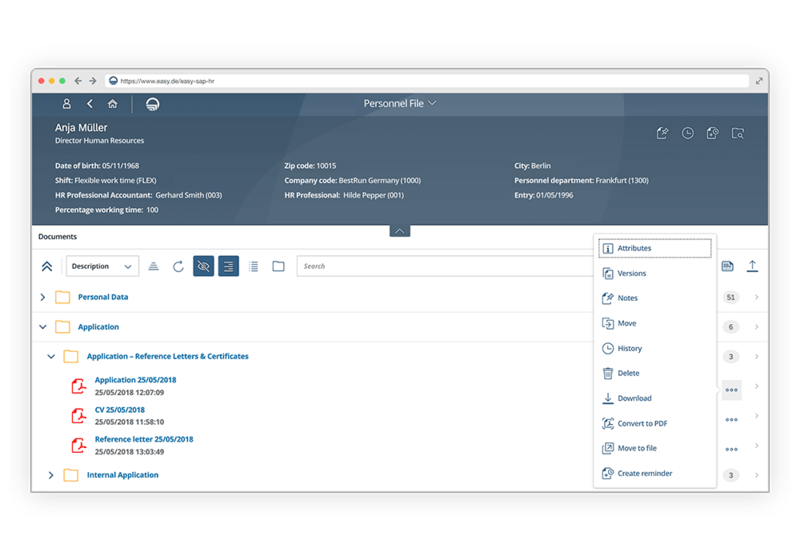 The special security requirements which apply to the handling of files and documents in human resources can be met effortlessly with the digital personnel file. Thus, for example, access rights are controllable down to the level of individual documents via SAP® rights and role management. Via Employee and Manager Self-services (ESS/MSS), you can both grant employees and managers access to the file and control the time-limited check-out with limited and logged access via the file check-out. That way, employees can revise their data directly or managers can grant approval and save a trip to the human resources department. New talents want to make their contributions as full-fledged employees as quickly as possible. Therefore, it is essential to professionalize the systematic orientation and social integration of new employees. Our standard version already includes checklists for activities in the onboarding process, so that you can successfully onboard new employees easily. All activities in the digital personnel file are continually logged. You receive automatic emails about queue entries as well as a complete history of the last opened file (content). A complete overview of all file processes allows maximum transparency. A report on stored personal data makes the digital personnel file from EASY GDPR-ready. 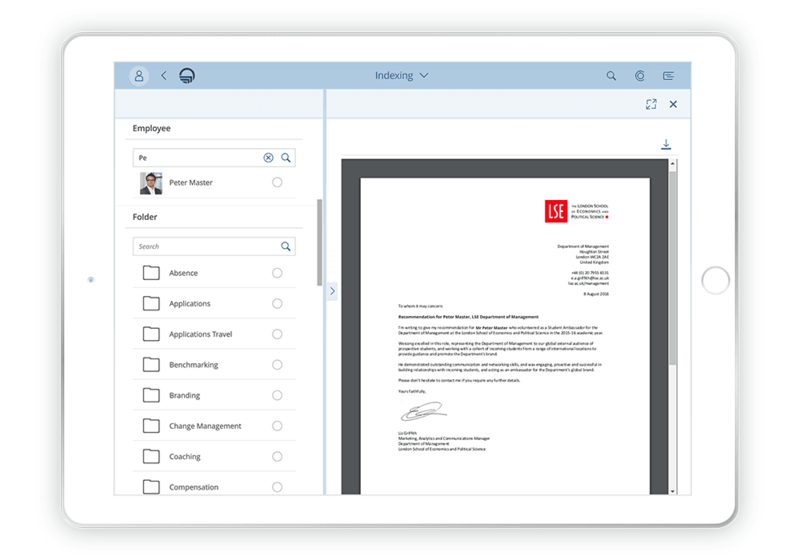 All documents, such as medical certificates, letters of reference, application documents, or even emails can be added easily to the personnel file via drag & drop. In addition, either early archiving via workflow or late archiving via bar code is possible. The bidirectional integration of the file in SAP® HCM® (on-premises) and SuccessFactors® (Cloud) is standard. That way, access from both systems is displayed in the same electronic personnel file. Everyone was motivated, because the EASY digital personnel file represented a significant simplification of the daily workload. Increase availability, be able to act more quickly and more flexibly – those are some reasons why it is worthwhile for companies to rise to the next level and gradually relocate their HR processes to the Cloud. 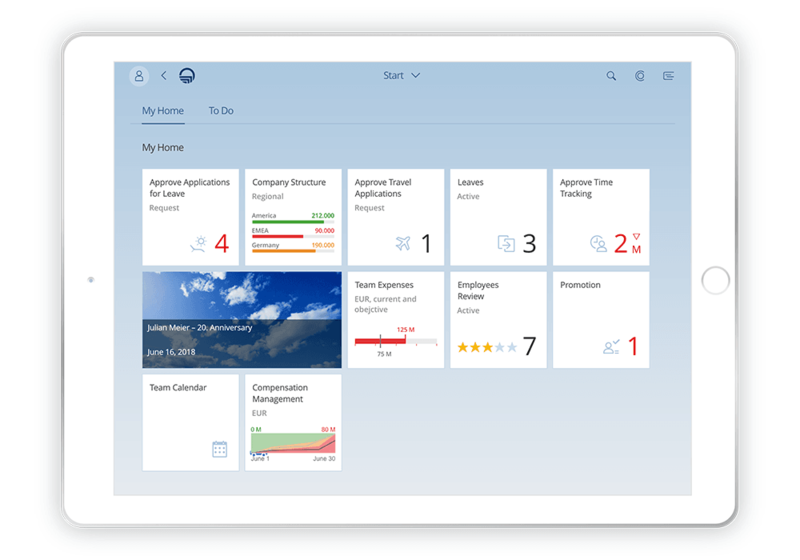 SuccessFactors® acts as a complete HR suite from the Cloud, with functionalities constantly being added by SAP®. Are you currently using on-premises and have mapped the core HR processes through SAP®? Then now is the time to optimize and use the existing processes. You should ask yourself the long-term questions: Do you want to move to the Cloud? And when do you want to move to the Cloud? You can acquire the digital personnel file from EASY as a tried and tested on-premises version. 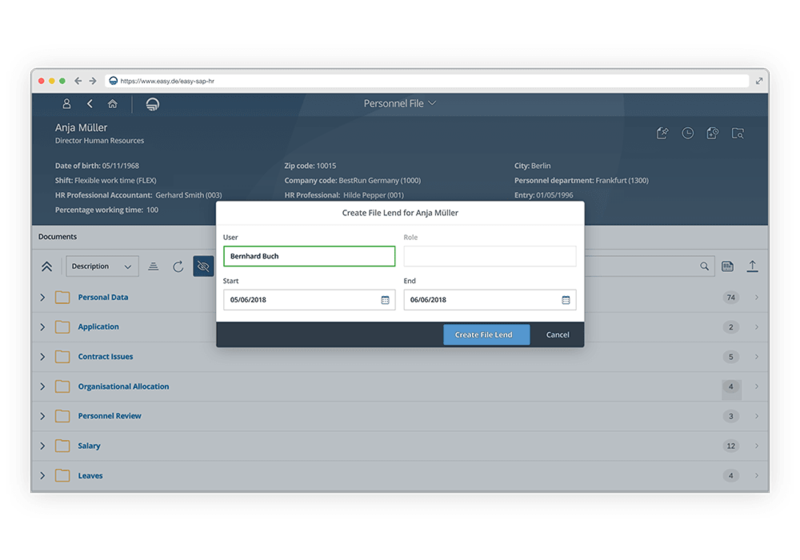 EASY SOFTWARE’s years of experience have gone into the new digital personnel file from the Cloud for SuccessFactors® to create a file solution optimized for operation purely in the Cloud. We have compared the essential differences and commonalities of the on-premises solution and the Cloud version for a more detailed insight. However, the development of the Cloud solution is progressing rapidly, and EASY is gradually releasing new functions.